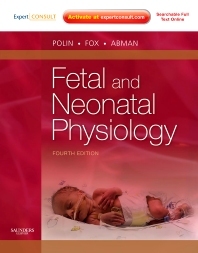 Fetal and Neonatal Physiology, edited by Drs. Polin, Fox, and Abman, focuses on physiologic developments of the fetus and newborn and their impact on the clinical practice of neonatology. A must for practice, this 4th edition brings you the latest information on genetic therapy, intrauterine infections, brain protection and neuroimaging, and much more. You’ll also have easy access to the complete contents and illustrations online at expertconsult.com. Gain a comprehensive, state-of-the-art understanding of normal and abnormal physiology, and its relationship to disease in the fetus and newborn premature infant, from Dr. Richard Polin and other acknowledged worldwide leaders in the field. Understand the implications of fetal and neonatal physiology through chapters devoted to clinical correlation. "Improved understanding of the human genome and the regulation of embryogensis has contributed in a major way to the content and new references. The editors have elimated clinical information which is easily found in neonatology text books and have achieved their goal of producing an excellent and comprehensive reference text. There is a Kindle version avaialbe and purchase of the two hard-back volumes includes access to the full text on-line. This feature is easy to use and provides a number of advantages...As a tool for identifying knowledge gaps it is a treasure trove for research scientists. It is a comprehensiverepository of present accumulated knowledge...I recommend unreservedly the purchase of this fourth edition to all European Neurology, Obstetric and Paediatric department libraries."